I just wanted to take a moment to honor and remember Jeanne Manford, the founder of PFLAG (Parents and Friends of Lesbians and Gays). She died today at the age of 92. 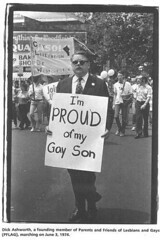 Jeanne became involved in the gay rights movement in 1972 after her son Morty was beaten for his involvement in a Gay Rights Alliance demonstration. At a time when having a gay or lesbian child was denied and not discussed, she wrote a letter to the New York Post (not the friendliest audience) stating, “I have a homosexual son and I love him.” She stood in the Christopher Street Liberation Day Parade (the precursor to NYC LGBT Pride Parade) with a placard that said “Parents of Gays: Unite in Support of our Children”. Shortly thereafter, the first POG meeting (at that time it was just called Parents of Gays) met at Metropolitan Community Church in NYC. Caitlyn Ryan of the Family Acceptance Project has empirically documented what we intuitively know: that family acceptance of LGBT youth protects against suicide, depression, and substance abuse, and is correlated with better health and self-esteem. In other words, family acceptance is a good thing and paramount to a LGBT person’s sense of self and well-being. Family acceptance may also help to mitigate the other detrimental effects of living in a homophobic culture. There is no way of knowing how many lives PFLAG has saved or how many families avoided estrangement. PFLAG gives parents a place to come together and struggle with their fears, their homophobia, ultimately with a goal of supporting and loving their children. Jeanne Manford leaves a powerful legacy – not just in starting PFLAG – but in being the kind of parent that every parent can aspire to follow. When I came out my grandmother contacted PFLAG and got some info from them. I learned about it from her years later! She had a gay nephew whom she loved who was much older than me and visited my home openly out with his partner throughout my childhood. In fact, my son is named for him. I never knew that she struggled with my coming out, she never let me know. Thankfully she had PFLAG to support her while she supported me.